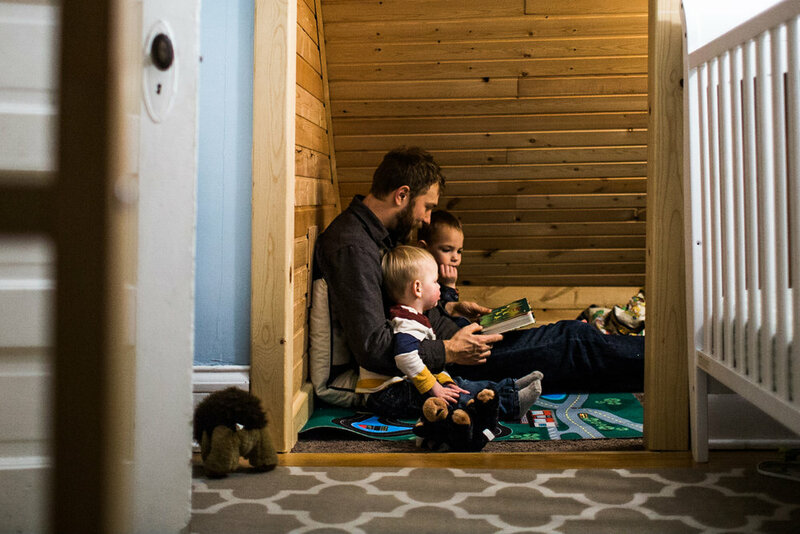 Colorado Springs photographer Danica Donnelly specializes in helping children feel safe, loved and connected in their families. She will come to your home to document your unique relationships. Affordable pricing and packages available. She has documented hundreds of families for over twelve years. Typically 2-3 hours. A small slice of your family life. We will plan some activities that are characteristic of your kids' childhood; baking pies in the fall, running through the sprinklers in the summer, playing board games after dinner. I will guide an experience or two to help your family focus on connection. From morning rituals to bedtime rituals and everything in between, with a few bonding experiences, guided by me. These are perfect any time of the year for any reason or no reason at all. An often missed opportunity for a full day session is that first week postpartum after you have brought baby home. You will be in a newborn fog and probably won't remember much of it at all. And yet that first week is such a beautiful time of transition and transformation that you won't want to miss out on. This includes me spending 4 mornings or afternoons with your family throughout the month. Your bonding experiences and photos will build on each other during our time together, deepening your family connections. This is my favorite because I really get to become an honorary member of your family! We will spend an afternoon or an evening together each month of the year. We travel though all the emotions of life together, the essence of what it means to be family. Our time together can also include grandparents and cousins. I will craft bonding experiences that build on each other throughout the year. These are great for baby's first year! They grow and change so much in those 12 months - this is the perfect way to preserve all their 'firsts'! Gifted to you for your full year session: Your memories will be preserved in an elegant, hand-crafted book that will be poured over throughout generations. Add on a 5-10 minute film that includes video clips taken throughout your sessions. Click below to see a sample film. Reduced to $525 for a limited time to celebrate my move to Colorado! Includes me being on-call for the four weeks surrounding your guess date, my time photographing during active labor through 1-2 hours after birth and a design consultation. I am also available for emotional support throughout your pregnancy and provide a calm presence during labor. Add on a 5-10 minute film that includes video clips taken throughout your sessions. Click below to see a sample birth film.